Today I am pleased to welcome one of my favorite bloggers- the lovely Carrie Vitt- to Healthy Green Kitchen. I first heard about Carrie when her book Deliciously Organic was released late in 2010. 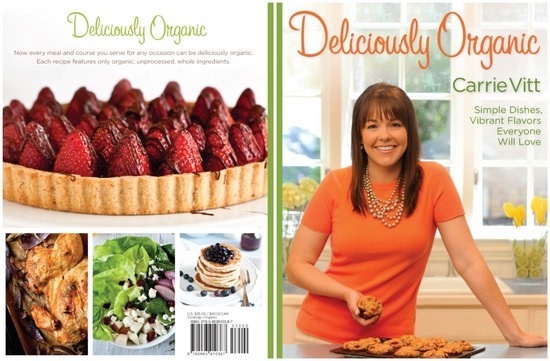 I learned about her blog Deliciously Organic at that point as well, and have been a dedicated reader ever since. We easily became friends on twitter (she tweets as delorganic so make sure to follow her), and when I once mentioned that I wanted to make my own kombucha, Carrie sent me a package with the scoby I needed to get started. From California. How could I not love her? When we met in May at the Blogher Food Conference, I was able to confirm that she’s just as awesome in person. I love her wholesome recipes and I am so honored she wanted to share one of them (her healthy tuna casserole), along with the fascinating story of why she made a pretty radical diet change, with my readers. Take it away Carrie! If you had two girls, under the age of two, and your husband, a fighter pilot, was flying cover during a war in Iraq, would you be thinking about converting your diet to organic, whole foods? I wasn’t. My life had enough stress without another distraction. But, that’s what happened in 2003. Two years earlier, after the birth of my second daughter, I began having daily migraines. I was 25. As migraines often are, they were both baffling and debilitating. They started with the birth of my first daughter, but were infrequent and not as severe. I often had to lie down in a quiet dark room, which was almost impossible with toddlers to care for. I was taking several medications to manage the pain just to get through the day. The headaches continued, though, four or more a week. After two years of struggle, my neurologist suggested adding yet another daily medication to my prescription regimen, a treatment that wasn’t working anyway. I kindly rejected her suggestion and drove home thinking: there must be another way. The same day I saw my neurologist, a tiny newsletter article caught my eye while going through the mail. It was about the benefits of organic foods. I knew migraines could be related to diet, so I wondered if changing to organic foods might help. I was at the end of my rope and willing to try something different. At the time, I was eating lots of vegetables to lose the last 10 pounds of baby weight. I replaced my lettuce with organic. It was my first step. I picked lettuce because it was the food I ate the most of. Within a week I noticed a significant difference. The frequency of my migraines decreased, and it was now easier to care for my kids. I didn’t need any more encouragement. I next switched all produce to organic with the intent of increasing the amount of pure and untreated food in my diet and decreasing my pesticide intake. As I dug deeper and learned more, I continued making changes to my pantry and refrigerator. Over the next year and a half, I converted my family’s diet to whole, unprocessed, organic ingredients, and I felt like a stranger in a strange land. I had a hard time finding recipes that were equivalent in flavor to what we were accustomed to. Nevertheless, I avoided such ingredients as white sugar, white flour, and partially hydrogenated anything. Recipes using whole grains were especially challenging. We weren’t ready to leave the world of paninis, pasta, and pizza, but just substituting ingredients didn’t exactly work out. As my husband likes to say, we ate some terrible pancakes during the transition. This was disheartening because I had grown up with a great love for cooking that I inherited from the women of my family. I’m blessed and grateful to be a part of a line of wonderful cooks going back generations in Louisiana. From this rich, generational heritage I discovered the bedrock value of simple, delicious recipes paired with creativity and boldness in presentation. I decided that if we were going to eat organic dishes they were going to taste every bit as delicious as the ones I was used to before. Over time, I shared with my friends and family how I overcame my health problems. And then I told others. Many were earnestly interested in learning more or in making changes to their own diets. I continued to tell my story, share my adapted recipes, and give encouragement through my blog, Deliciously Organic, and in my recently published cookbook of the same name. Through organic, unprocessed food, our family of four was able to overcome: severe asthma, eczema, IBS, and migraines. No drugs. Just good, natural, real food. 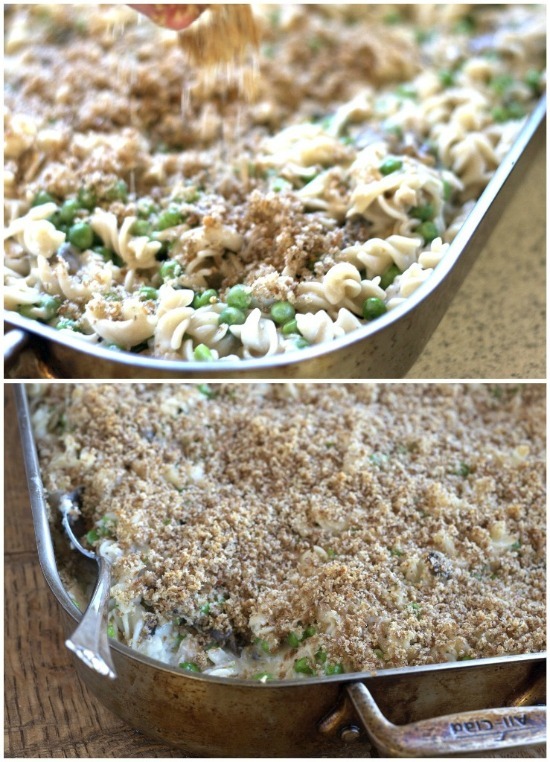 A wholesome tuna casserole: make sure to use organic, unprocessed ingredients in this recipe and whenever possible. 2. Melt butter in a medium saucepan over medium heat. Stir in mushrooms, garlic, salt and pepper. Cook until mushrooms have released their moisture, about 5-7 minutes. Sprinkle in arrowroot while continuously stirring for about 30 seconds to prevent the arrowroot from clumping. Stir in the stock and cream and simmer until sauce is thick and reduced, about 12 minutes. 3. Toss pasta, mushroom sauce, tuna, peas and cheese in a large bowl. Season to taste with salt and pepper. Pour into a buttered 13 x 9-inch baking dish and spread evenly. 4. Place bread and melted butter in the bowl of a food processor or blender. Pulse until finely ground (the crumbs will be moist). Evenly distribute buttered crumbs over top of pasta mixture. Bake for 30 minutes, or until bubbly and golden brown on top. 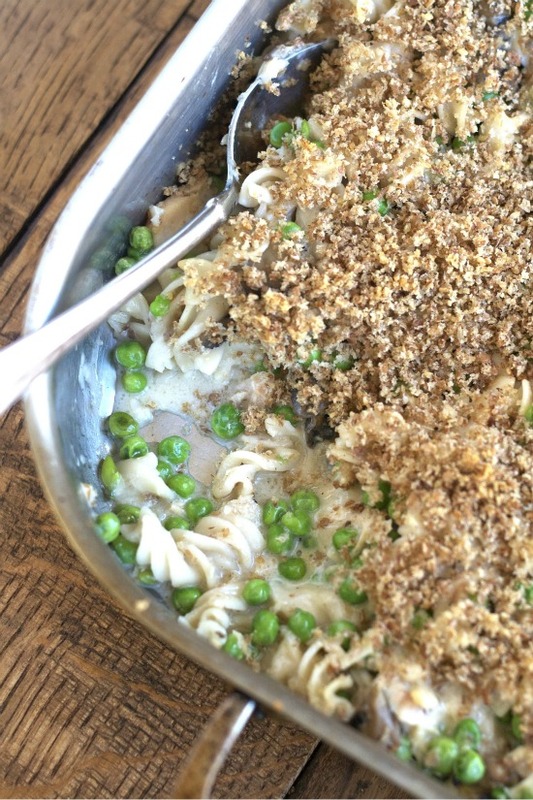 What a great story…and, a delicious looking tuna casserole! This is the kind of food I’m ready for as the weather gets chilly. Yum! This looks like a great family dish. Interesting about Carrie’s migraines going away! It was so interesting to see Carrie’s story – thanks for a great guest post! This looks so insanely good I had to rest a moment. I feel like I made a new friend – thanks to you both! Nice recipe. I don’t use tuna packed in oil often, but I was wondering if this called for draining the tuna, or using the oil it is packed in as part of the sauce. Thank you in advance!! Carrie, what a great recipe and thank you for your post. You bring up a lot of great points that I need to think about. I wish I got to meet you at BlogHer Food! looks yummy, and unprocessed-a definite bonus-but I’m not sure I would go all the way to saying “healthy”. Too much butter, cream, cheese for that! You recipe calls for penne pasta, but it looks like you used rotini??? Does that make a difference? Also, do you have the nutrition info for this? While I think the whole wheat pasta is a good switch, I’m not sure that it can be called “healthy” (cheese, heavy cream and lots ‘o butter!). this is the BEST tuna casserole!! especially being a gluten free version. i really wanted a tuna casserole that tasted like what i grew up with…. the extra fats, i think, turn out to be a bit negligible since you are way filled up before you can eat enough to be unhealthy. assuming of course, that you add a nice veggie salad to go with. I a, substituting the milk with plain yogurt- hoping it turns out well! So thankful this recipe didn’t call for canned soup- sorry that’s not real cooking! “Mushroom” describes a variety of gilled fungi, with or without stems, and the term is used even more generally, to describe both the fleshy fruiting bodies of some Ascomycota and the woody or leathery fruiting bodies of some Basidiomycota, depending upon the context of the word. :”;..